You were girded in a belt of victory at your death Peter. His homeland was Constantinople, and he was born to God-loving parents, who with their entire family decided to live monastic lives. Because his older brothers, Paul and Dionysios, first became monks, together with the younger brother Platon, they also became monastics in imitation of their zeal. So much did the blessed Peter struggle to exceed all his peers in asceticism, that not only his brothers, but also other monks considered him to be a model and example of virtue. And whatever good they found in him, they were eager to copy and form in their own life. 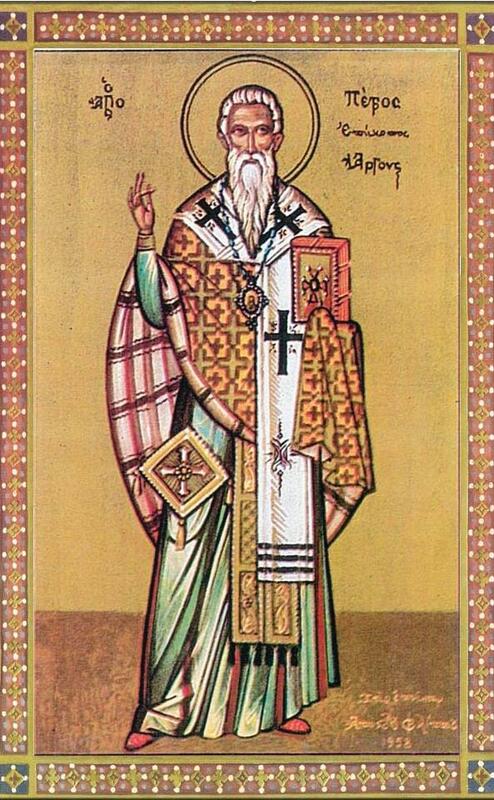 Hence the then Patriarch Nicholas, the Italian, amazed by him and praising his virtues and eloquence, was eager to honor him with the Episcopacy. Peter was not pleased with what was happening at that time, so he did not submit to this. Wherefore the Patriarch persuaded his brother Paul* with exhortations, and he ordained him Bishop of Corinth in the Morea. Peter fled the constrain of the Patriarch, and went with his brother Paul the Bishop to Corinth, and there he passed much time in quietude. But he did not attain his purpose completely. 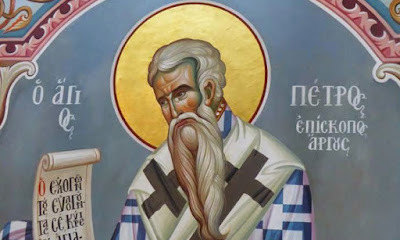 For the Bishop of Argos died, and the Christians of Nafplio and Argos went to the holy Bishop of Corinth, pleading with many entreaties, to ordain for them as Bishop his brother Peter. Therefore Peter was compelled, being not in agreement with this, to leave and he was missing for a long time. When he returned, they troubled him even more, so that slowly slowly he agreed due to their tears, and he received the privilege of the presidency. Having become Bishop, the first thing he set to do was make good arrangements for the Priests and the churches. Second, he arranged for every Priest to have what appertains to the guarding and the protection of souls. So much did the thrice-blessed one spread out his hands to almsgiving, that often times he did not even keep his undershirt for himself, but he gave it to the hungry. He took care of the orphans, helped the widows, and all those who were in need of cheer he granted mercy. Thus one time, when there was hunger in the Morea, the Saint nourished thousands of people. And having given the Saint a jar with a little flour, then by his prayers - O the miracle! - the jar was full again, and it lasted a long time, not only for those in want and the hungry, but also for his own people. * His feast is on March 27th. ** He reposed around 925. His relic was taken to Rome by a Latin bishop in 1421, but was returned to Argos in 2008. It is currently located in the Cathedral of Argos. 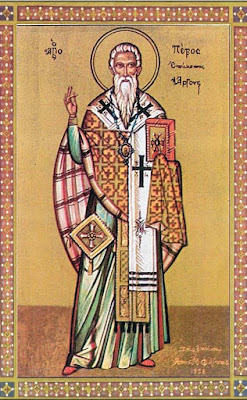 An invulnerable rock, of the Church, an excellent shepherd, of the city of Argos, you have been shown to be all-praised Hierarch. And as a faithful manager of grace, you liberate us from all diseases. 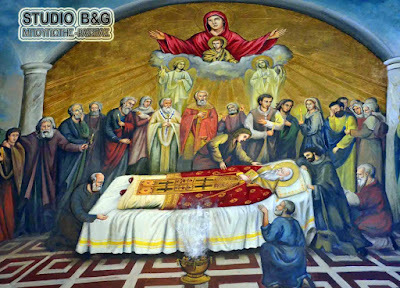 Venerable Peter, entreat Christ God, to grant us the great mercy. 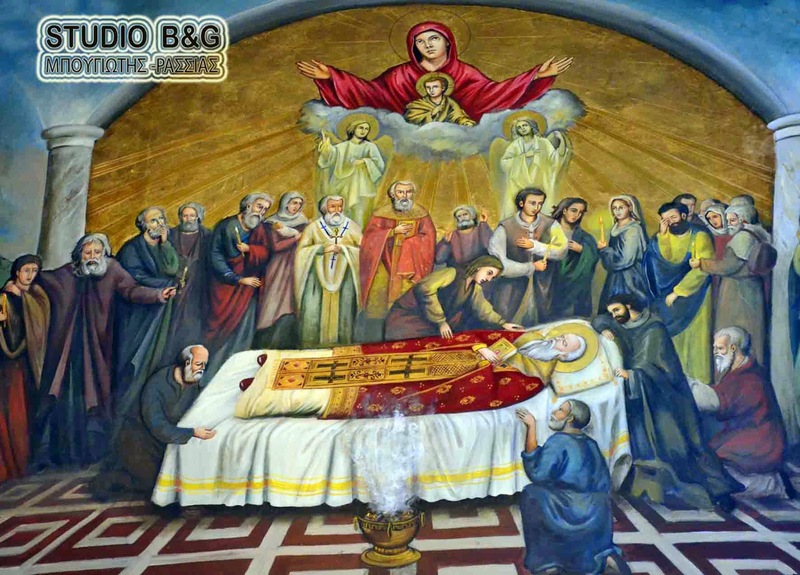 Of the Foremost of the wise Apostles, you were gloriously named Father Peter, fairing sumptuously by him of holy gifts, zeal for the faith, you piously practiced, and your divinely-inspired life, was adorned with miracles. Priest of the glory of Christ, save from dangers, those who honor you. Rejoice offspring of Byzantium, and the shepherd and aid of Argolida; rejoice Spirit-bearing rock of the Church, the water of grace Peter you gush forth.